Students will be able to illustrate an amount that is less when compared to another quantity. Students will be able to compare quantities and determine which has less. Before starting the lesson, write the numbers 1-6 on the six index cards. Show your class your puppet, and introduce it as Lesster. Tell them that Lesster loves to compare numbers. Display two number cards, and have Lester "choose" the card with the smaller number on it. Ask your class what they noticed about the number that Lesster chose. Repeat this activity until the students realize that each time, Lesster likes the smaller number. If the class doesn't realize what's happening, give them clues to help. For example: What is special about the number Lesster chooses? Why does he pick one number instead of the other? Explain that Lesster only likes numbers that are less than the other number. Define the word "less" as being smaller or not as much. Review numbers 1-10 in both English and student home language (L1). Define compare as finding out how things are different or the same. Provide physicial representations for each number as well as the written numeral when Lester compares numbers. Have students turn and talk to share with a partner why they think Lester chooses a certain number each time. Draw two large boxes on the board. Draw two amounts of objects in the boxes. For example, draw 3 balls in one box and 5 balls in the other. Write the corresponding numeral next to each box. Tell the class which number is less. Remind students what it means if a number is less. For example: "The number that is less is the number that is smaller or not as much." Repeat the illustration, asking the class to tell you which number is less than the other. Count each of the groups aloud. Ask the students to echo-count after you as you recount each group. Identify which group is less. Point to each group and have students give you a thumbs up when you point to the group with less. 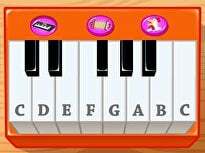 Ask students to chorally count with you as you count the groups. Point to each group and ask students to say "more" or "less" aloud. Group your students into pairs of two. Give each pair of students an egg carton and several manipulative counters. Write a number on the board. Tell students to place an amount that is less than the number on the board into the egg carton. Students should use only one counter per egg hole. For example: "Put less than 6 counters in the carton." Check the work of each pair of students. Pair students who speak the same home language (L1) together. Ask students to place one less in their egg carton than the number shown. For example, say something like, "Place one less than 6 counters in the carton." Have students count their items aloud as they place them in the carton. 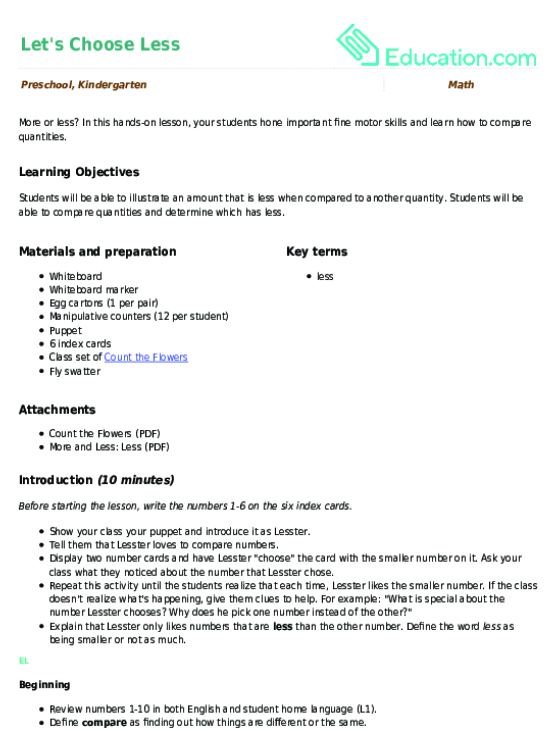 Pass out a copy of the Count the Flowers worksheet to each student. Read the instructions aloud to your class. Answer any questions students may have and then instruct your class to complete the worksheet independently. Pair students together to complete the worksheet or have them do it in a small teacher-led group. Ask students to turn and talk to share their thoughts on which group has less items to a partner. Provide sentence frames for them to utilize: "I think __ __ __ __ has less because __ __ __ __." Give advanced students two egg cartons so they can practice comparing numbers that are larger than 12. For example: Place an amount of counters that is less than 20 into the carton. 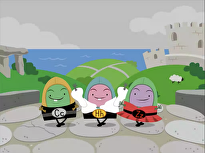 Encourage students to try comparing numbers without counters to strengthen their abstract concept of quantity. Encourage struggling students to count aloud as they work on their worksheet. Then, have students use counters to recreate the comparisons on the worksheet, pairing each counter from one number to a counter from the other number. Explain that the number with a larger number of counters is more, and the number with a smaller number of counters is less. 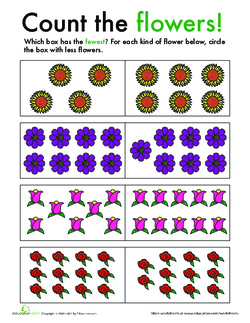 Assess each student's Count the Flowers worksheet to gauge whether or not they understand the concept of less. Take note of which students are able to identify the groups with less items during the guided practice. Ask guiding questions as students work to assess their understanding: "How many are in this group?" 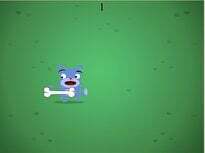 "Which group is smaller? How do you know?" Listen to student discussions to assess if they are able to accurately determine which group has less. Note any strategies students are using and any areas of confusion (e.g., mistaking number order when counting). Write two numbers on the board. Call a student to the board and give them the fly swatter. Tell them to hit the number that is less with the fly swatter. Have students give a thumbs up to show the number that is less when you point to it. Ask students to turn and talk to a partner to share which number is less. Using her counting skills, your child will learn the difference between more and less by figuring out which flock, gaggle, or group has the most in it. Help your child master the idea of more, less, and equal. 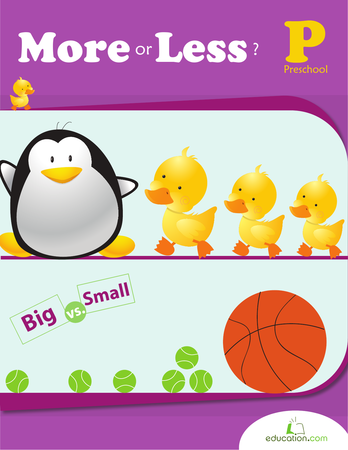 This workbook is filled with math comparison exercises that teach your preschooler the basic math concept of sizes and amounts. This colorful counting page is engaging math practice for your preschooler learning to count, and to compare more or less values between groups of electronics! 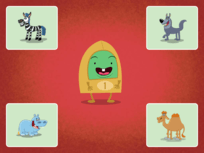 This colorful counting page is engaging math practice for your preschooler learning to count, and to compare more or less values between groups of animals. This colorful counting page is engaging math practice for your preschooler learning to count, and to compare more or less values between groups of butterflies. By counting groups of objects and deciding if one is less than, greater than or equal to the other, your child will be learning important math skills. 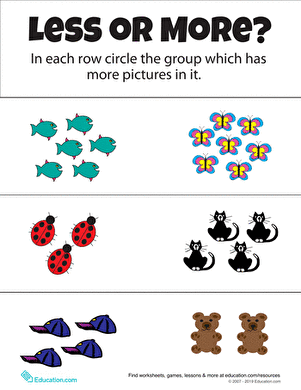 Count colorful pictures out loud and compare groups of items to begin learning about greater than and less than. This worksheet deals with groups of 4 to 7.